Freddie Timms was born at Ngarrmaliny (after which he takes his name). He worked as a stockman on various East Kimberley cattle stations for most of his life and he helped paint the boards and danced for the Gurirr Gurirr ceremony devised by Rover Thomas. Subsequently when canvas and paints were supplied to some of the more senior artists, including his father-in-law George Mung Mung, Timms asked for painting materials and began to develop his own style of painting informed by Rover Thomas but recognizably his own, with discrete areas of colour outlined in double rows of dots. 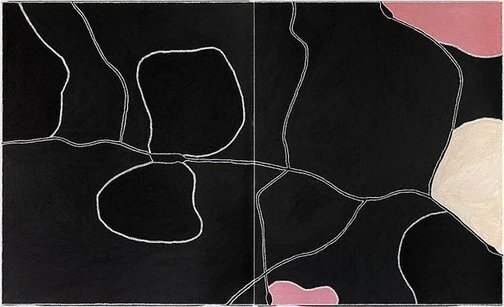 Timms predominantly used an aerial perspective of country to create detailed personal maps of his East Kimberley landscape. Jack Yard is on Bow River Station where Freddie Timms lived as a boy. The pastoral lease is now owned by family members. In the painting 'Jack Yard' 2004, the road is shown entering the country of the painting near a spring (near the pink section at the bottom centre), coming from the station and present day community settlement at Bow River. It passes through the picture and goes to Greenvale, to Foal Creek, where the artist was born, back to Violet Valley and back around to the highway. The Wilson River with the large permanent waterhole at Jack Yard, runs across the painting from left to right. The two black shapes on either side of the main living waterhole are the hills around it. Moat Creek runs down from the top of the left-hand panel to join the Wilson River. Moat Creek Hill is in the top left-hand corner. Another creek running from Cargo Spring begins at the bottom of the left-hand panel, joining the Wilson River in the lower part of the right-hand panel. Another tributary of the Wilson River, Thirsty Creek, is shown running down from the top of the right-hand panel. It has another 'living water' or permanent waterhole with lots of bream. Another waterhole on the Wilson near Gorge Yard is shown on the far right of the picture. The yellow area shows part of a hill near Gorge Yard that runs down to Crocodile Hole. The pink at the top shows a hill that goes back towards Clara Spring. Timms knew this country well from time he spent working there as a stockman. Signed verso on canvas [part a], black fibre-tipped pen "F TIMMS". Signed u.l. corner verso on canvas [part b], black fibre-tipped pen "F TIMMS". Art Gallery of New South Wales annual report 2005 , Sydney, 2005, 18, 19 (colour illus. ), 64. Art Gallery of New South Wales: highlights from the collection , Sydney, 2008, 48 (colour illus. ), 49 (colour illus., detail). Hetti Perkins, Look , 'One sun one moon', pg. 22-27, Sydney, Jun 2007, front cover (colour illus., detail), 9 (colour illus.). John E. Stanton, One sun one moon: Aboriginal art in Australia , ‘Contemporary art of the East Kimberley’, pg. 239-247, Sydney, 2007, 244-245 (colour illus.). Jill Sykes, Look , 'Doing it with Contempo', pg. 23, Sydney, Oct 2005, 23 (colour illus.). Australian art review , New South Wales, Nov 2007-Feb 2008, 23 (colour illus. ).